A few weeks ago I submitted several of my photographs to my very first Juried Photography Exhibition. 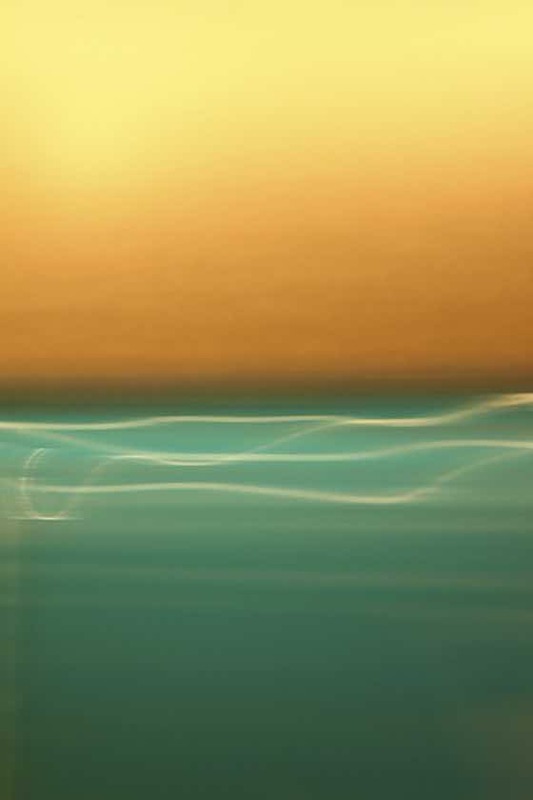 I’m thrilled to announce that one of my abstract photographs, “Abstract 8167”, was accepted! 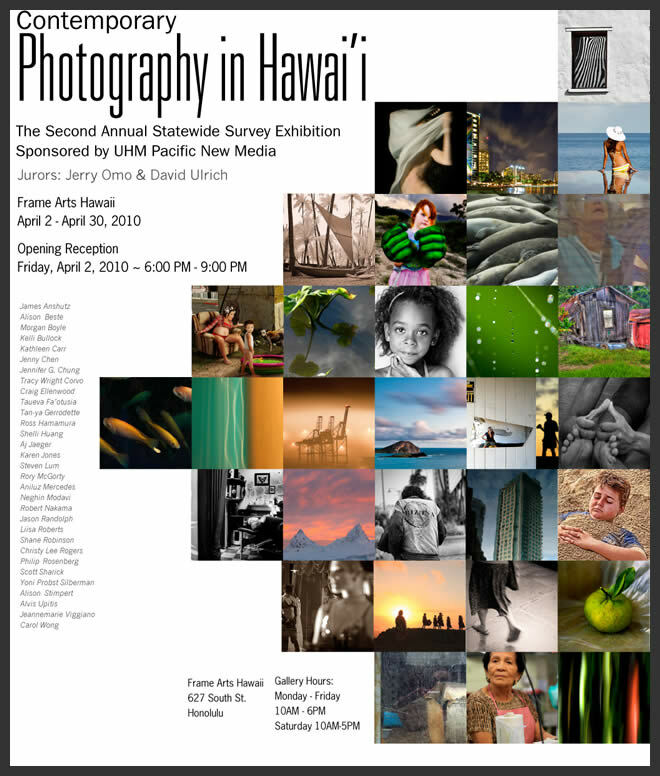 The exhibition is titled, “Contemporary Photography in Hawaii 2010: The Second Annual Statewide Survey Exhibition.” It is sponsored by University of Hawaii at Manoa Pacific New Media and was juried by Jerry Omo and David Ulrich. From the exhibition description: The Second Annual Survey Exhibition Sponsored by Pacific New Media. This juried exhibition is open to all artists using photographic processes: traditional silver or color prints, digital imaging, alternative processes and mixed media explorations. Contemporary Photography in Hawaii 2010 is meant to offer artists that use photographic processes a venue for exhibiting work and to provide a snapshot of the “state of the art” of photography in Hawaii. Hawaii residents, amateurs and professionals, are welcome to submit images. Works must show evidence of a photographic process in their creation. 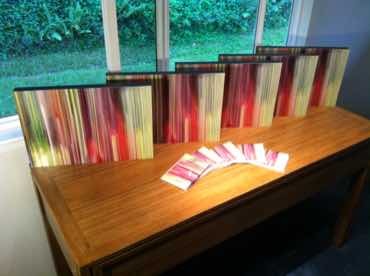 The photographs I submitted for the Contemporary Photography in Hawaii 2010 exhibition were created completely in camera. I don’t even own Photoshop. Yet! 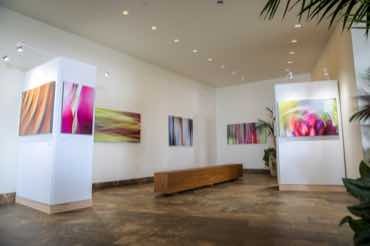 Additionally, the 16 x 20 inch photographs are created by a state of the art process that infuses dyes directly into the surface of specially coated aluminum sheets. Because the image is infused into the aluminum surface and not simply printed on it, the prints are archival without requiring frames or glass; ultra-hard and scratch-resistant; completely waterproof and weatherproof; can be cleaned with any commercial glass cleaner; and radiate a brilliant and luminescent quality that cannot be achieved with high quality paper or traditional printing techniques. The painterly abstracts where created by experimenting with Intentional Camera Movement (ICM) and by manually adjusting aperture, focus, and shutter speed. I imported them directly from the camera into Apple’s Aperture where only lens dust specs were removed. No color corrections, filters, or enhancements of any kind were applied. Here is a short “unboxing” video that Roxanne shot when the photographs arrived from the printer. The first photograph is from my “Negatives” series that I haven’t yet posted. Below is the exhibition poster.